The helmet is without question, the most important piece of safety equipment in the world of football. A well made and properly fitted helmet will protect the player’s head from trauma and from the effects of intense physical impact during the game. The football helmet has gone through many different stages of development throughout the years and must meet strict and stringent standards for safety. Helmet designers are constantly striving to engineer products which improve the protection and safety of all football players. Schutt, the leader in cutting-edge helmet protection technology, is constantly improving its head cushioning, comfort and flexibility features. Measure the player's head. 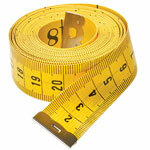 Wrap a flexible tape measure around the head, about an inch above the eyebrows, to determine the head's circumference. Use the Schutt football helmet size chart and select the proper helmet based on your measurement. 22 1/4 - 23 3/4"
Insert the air pump into the hole on the helmet and fill the helmet pads with air. Ask the player if the helmet is becoming too tight or if it is too loose. Stop pumping air based on the player's feedback. Check the height of the helmet. The front rim of the helmet should rest about an inch above the eyebrows. Fasten the chin strap so that the straps have equal tension on all sides. Grip the helmet on the sides and rotate it side to side then up and down. The skin of the forehead should move with the helmet. Leave the helmet on for a minute, then take it off and check the color of the forehead. There should be no whiteness or redness on the forehead. If there is, then the helmet is too tight.